Loudoun Guns is pleased to sponsor two of the top professional shooters in the field - Greg Jordan & Tommy Thacker. Follow this page to see pictures & videos from their events & follow along with their competition schedule. You can also visit our blog http://loudoungunsinc.blogspot.com/ to ask any questions of the pro's and learn more about the industry. Up to this point Greg had been shooting his entire life, but never in any sort of formal competition. Heading to the range that day he did not know what to expect. After watching the match for a short time he was hooked. Greg was invited back to the club for a practice session where the hook was sunk even deeper. 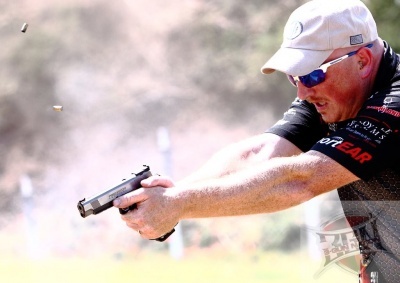 Since that day Greg has competed in USPSA matches and has recently ventured out into the sport of 3 gun, to which he now dedicates all his practice time to. Greg found 3 gun to be a better fit for him in that it allows him to train and stay proficient with all three weapons which also benefits him in his career as a law enforcement officer. 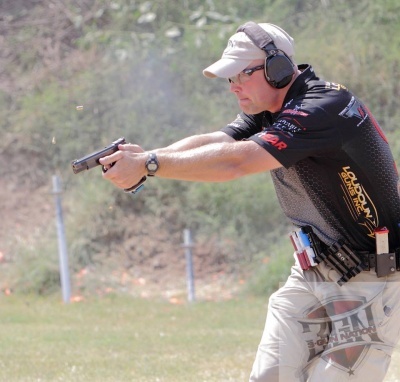 Not only has 3 gun made Greg a more well rounded shooter, he feels that the lessons that he’s learned from the sport can be passed on to the officers that he trains on a daily basis. Tommy Thacker has dedicated over fifteen years supporting our 2nd Amendment rights by successfully building on positions in the firearms industry that have spanned retail sales and management, gunsmith and refurbishing.